Last week was a really busy week for options trading well over 20 different positions being put on or taken off. I'm really enjoying my foray into options to see if it's something I can keep in my arsenal for generating income along with my dividends. Once we reach FI I obviously want our dividends to cover our expenses because it truly is passive income; however, until we reach that point I'm open to all avenues to build up our portfolio. Armed with my new TastyWorks Roth IRA, I started to put on several defined risk option plays because there just isn't enough capital to there to do much else. TastyWorks is really geared toward options traders with $1 per contract commissions and $0 to close; however, even for just long term dividend growth investors it's an intriguing choice. For stock purchases commissions are $5 to open and $0 to close which is still much lower than just about every brokerage out there. *Affiliate Link Incoming* If you're interested in opening an account with TastyWorks I'd appreciate it if you do so through this link. 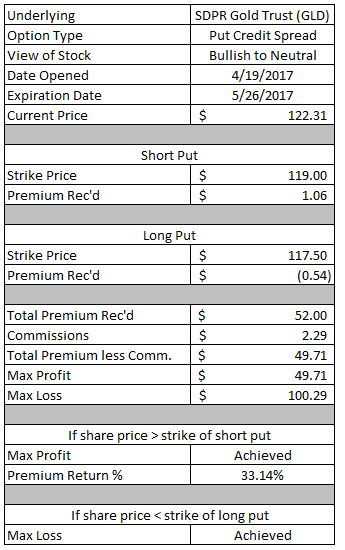 With 20+ moves to recap I've decided to split my regular options roundup post in two. Today's post will cover all of the new and rolled positions from last week and a post coming out later this week will cover the closed/expired positions. With just $4,510 in capital to work with that's forcing me to go with defined risk strategies in my new Roth IRA account. That's fine though because it gives me an opportunity to put on significantly more positions that should get the probabilities to work out closer to expected over the long run. Plus it let's me take different sides of the market so I'm not exposed to just one direction. The call credit spread is created by selling an OTM call option and buying a further OTM call option and is a bearish to neutral strategy. The maximum profit I can make on this trade is the credit received at the position open less commissions or $58.71. The maximum capital at risk is $141.29. If IWM's share price remains below the $139 short call then all options will be OTM and I'll get to keep the full option premium as profit. The $58.71 would be a 29.4% return on the $200 ($2.00) width of the spread. If IWM's share price rises above the $141 long call then both options would be in the money. In that case the spread would be worth $2.00 or $200 and I would lose $141.29 as the maximum loss would be achieved. At order entry the probability of profit for this trade was around 70%. The iron butterfly, iron fly, is essentially an iron condor expect the short call and short put share the same strike price. It's still a neutral strategy like the iron condor; however, it's much more of a play on volatility declining than anything else. It's a bit riskier than an iron condor since you have less wiggle room on the underlying share price although in exchange for that risk you take in a much larger premium up front. The maximum profit that I can make on the iron fly is the credit received at the time the position was opened or $281.42. The maximum risk is the largest width of the spread, $108 - $103 or $103 - $98, $5.00 less the credit received. Therefore the maximum risk is $218.58. If the share price of FXE ends up at $103 at expiration I will achieve the maximum profit. That would represent a 129% compared to the maximum loss I could see. If the share price of FXE ends up lower than the $98 strike of my long put or higher than the $108 strike of my long call then I'll realize the maximum loss. Since this is relatively risky trade, all things considered, I won't be aiming to take anywhere near the maximum profit. Ideally time would just move along and eat away at the price of the options and some of the implied volatility will decline meaning lower option prices as well and then I'll just close out the position. My target is to realize a profit of 10-25% of the maximum potential profit or $28-$70. I might have gone a bit overboard with my iron fly's last week because there's still one more to report after this one. The maximum profit I can realize on this trade is the $70.42 credit I received upon opening the position. The maximum risk is the largest spread width, $1.50, less the credit received bringing the maximum risk to $79.58. 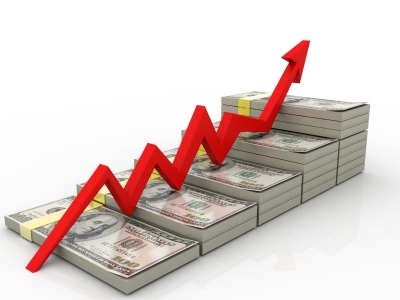 My target is to realize a profit of 20-25% of the maximum profit potential or $14-$17. If you glance at my portfolio you'll notice that there's no exposure to the utilities. That's not really by design rather it's due to utilities as a whole being very expensive whenever I had capital available. So I went with the iron fly strategy since it's a more aggressive strategy and provides a decent profit potential. The maximum profit I can achieve on this trade is the $140.42 credit received at order entry. The maximum risk on this trade is $159.58. My target is to realize a profit of 20-30% of the maximum potential profit or $28-$42. As I mentioned earlier the iron condor and iron fly are very similar in set up. However, the iron condor is different in that the short strikes of the spreads are at different strikes meaning you have a range that the share price can move between and still realize the maximum profit. The maximum profit that I can make on this iron condor is $44.42. The maximum risk is the largest spread width, $4.00, less the credit received or $355.58. Yikes! If SPY's share price remains between the $223 strike of the short put and the $242 strike of the short call then I'll be able to realize the maximum profit. At expiration if SPY's share price is lower than the $219 strike of the long put or higher than the $246 strike of the long call then I'll realize the maximum loss. My target is to realize at least 50% of the maximum potential profit or $22. The put credit spread is the exact opposite of the call credit spread. The put credit spread is created by selling an OTM put option and buying a further OTM put option and is a bullish to neutral strategy. The maximum profit potential on this trade is the $40.71 credit received at order entry. The maximum risk the $1.50 spread width less the credit received or $109.29. I will realize the maximum profit if Nike's share price remains above $55.50 at expiration and will realize the maximum loss if Nike's share price is less than $54. My target is to realize at least 50% of the maximum profit potential or $20 on this trade. I'll cover this later in the post but I closed out my open covered call on Nike last week and the time was right to sell another one. I was tempted to make this a covered strangle, but decided against it since I currently have an open put on Nike that is well in the money. While I love Nike the company the valuation just isn't quite right to potentially load up on 300 shares. I originally purchased these shares back in late March as part of a buy-write expecting that the share price would continue to move higher. Unfortunately that didn't happen, but I'm just fine owning Nike and selling options to reduce my cost basis. 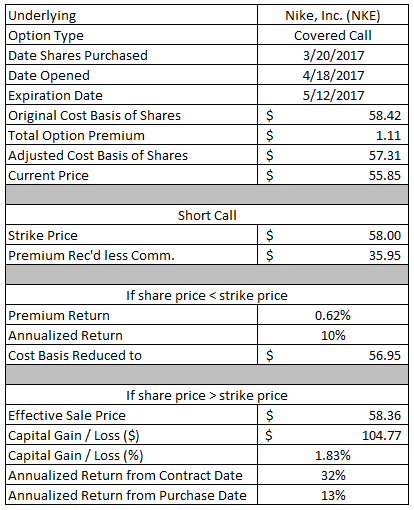 I purchased the shares for $58.42 and have received a total of $1.11 via option premium from closed call positions sold on these shares. The adjusted cost basis on these shares if down to $57.31 in about 1 months time. 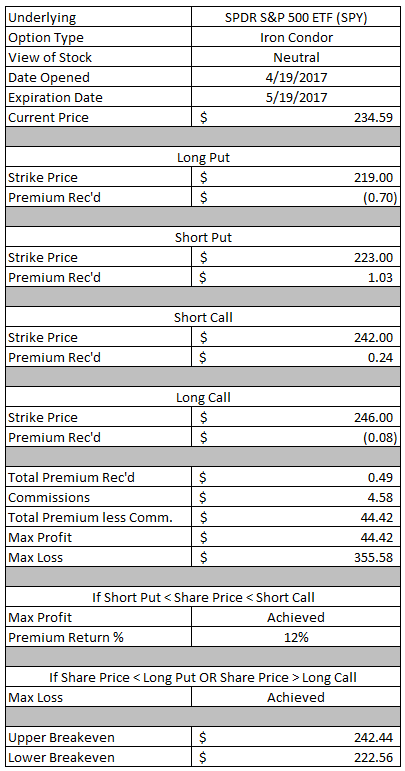 By selling the new covered call at the $58 strike I received $35.95 in option premium. If Nike's share price is above $58 at expiration then I'll have to sell my shares at an effective sale price of $58.36. That will net me a $104.77 or 1.83% return on my adjusted cost basis. The annualized return from the date I purchased the shares would be a solid 13%. If Nike's share price is below $58 at expiration then the call option will be OTM and I'll get to keep the option premium as profit. The $35.95 would be a 0.62% return on the $58 strike price or 10% annualized if held through expiration. Additionally my adjusted cost basis would be reduced further from $57.31 to $56.95. Despite the run up in gold over the last few weeks I'm still bullish on it from an investment perspective. Since the capital is limited in my new Roth IRA account that meant a defined risk position which my go to play is the put credit spread. The maximum potential profit on this trade is $49.71. The maximum risk is $100.29. If GLD's share price is above $119 at expiration then I will realize the maximum profit. 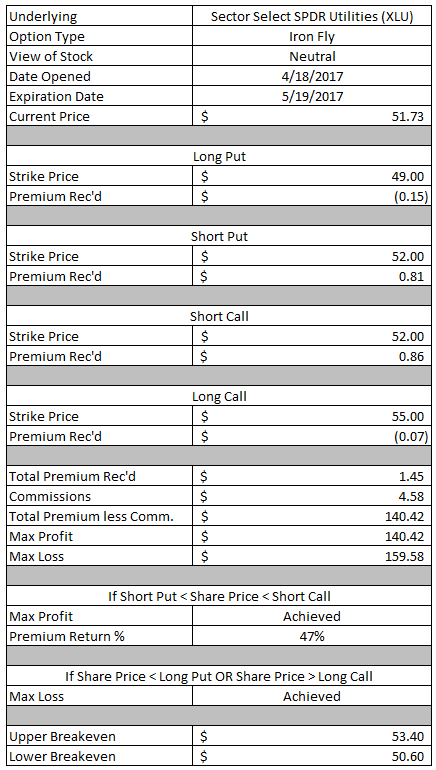 The $49.71 in option premium would represent a 33.1% return based on the $1.50 width of the spread. If GLD's share price is below $117.50 at expiration then I will realize the maximum loss. My target is to close out the position early at 50% of the credit received or around $25. The standard option cycle's expiration is the 3rd Friday of every month which typically means there's lots of decisions to be made if you're still holding options that expire in just a few days. Well, this past Friday was one of those and unfortunately I had to roll several of my positions out in time because I wasn't quite ready to take the shares. I had started throwing in some short dated option plays on GDXJ in an attempt to churn out profits in a short time frame. The idea was to sell either ATM or just OTM put options about 1 week out and if things went awry to just roll the positions out in time. That's exactly what happened here. I originally sold this put option on April 11 with a $36.50 strike price for $0.76. 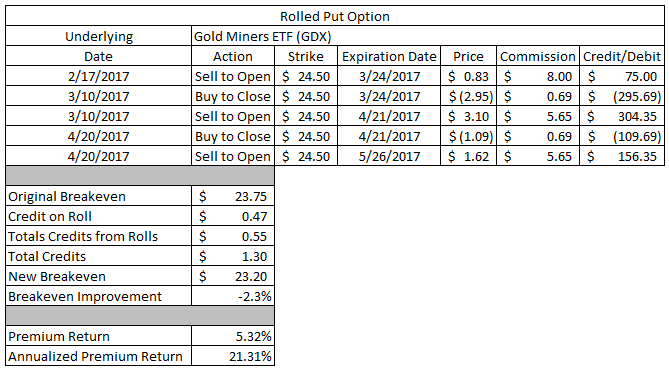 Since GDXJ was lower than $36.50 with expiration fast approaching I rolled the position both out in time AND down in strike. By rolling the contract I was able to collect an additional $0.85 in option premium bringing the total credits received to $1.61. The original breakeven point was $35.74 and after rolling the position the breakeven is lowered to $34.39. That's a 3.8% reduction. 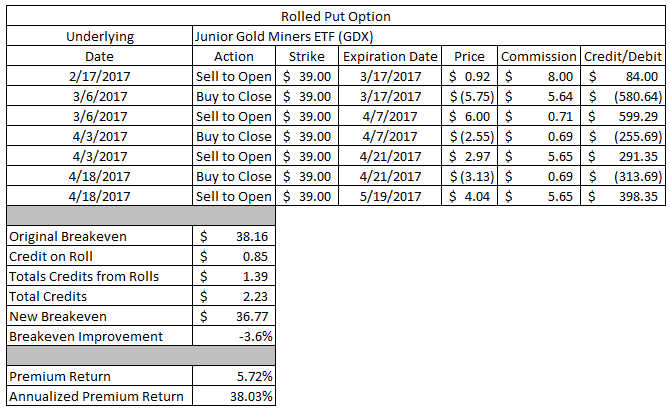 If GDXJ is above $36 at expiration then the contract will be OTM and I'll get to keep the full option premium as profit. The $1.61 in credits received would be a 4.41% return on the original contract's strike price. The annualized return would come to 66%. This position has been with me for a while now and unfortunately I expect to have to still hang around even after this roll. Although luckily the risk for gold and it's related products is to the upside so it won't be long until I should be able to just take assignment of the shares and then start selling calls against the position. At least that's how I foresee this one playing out. As I mentioned earlier this position has been around for a while. The original contract was sold back in February and brought in an $0.84 credit. Since then I've rolled the position 3 times now bringing in a total of $1.39. The total credits received are up to $2.23. The original breakeven on this position was $38.16, but by rolling the position out in time I've been able to collect additional premium and lower my breakeven price to $36.77. That's a 3.6% improvement. If GDXJ ends up higher than $39 at expiration then I'll get to keep the full option premium as profit. The $2.23 in total credits received would equate to a 5.72% return or 38% annualized. The current price of GDXJ is $34.54 so there's likely still some more work to be done in order to get my breakeven price close enough to the underlying price to feel comfortable taking the shares. Although I've bought myself another month's worth of time to make a decision. Seeing a pattern here? This was another attempt at a short term near the money put option that didn't quite work out. I wasn't actually at the point of needing to make a decision on this just yet, but threw out an offer to roll the position both out in time and down in strike. This contract was written on Monday of last week, but by Wednesday it was rolled both out and down. The original contract was for a $35 strike put option and I collected a $0.78 credit. 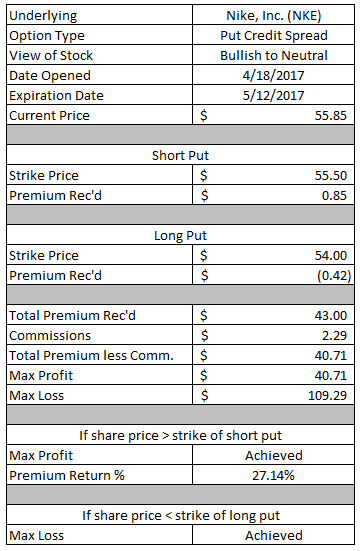 By rolling the contract out in time by approximately 3 weeks, as well as down in strike by $1.00, I was able to collect an additional $0.24 of option premium. The breakeven on the original contract was $34.22. By rolling the position for a credit the breakeven is lowered to $32.98. That's a 3.6% improvement to my breakeven point. If held until expiration and GDXJ is above $34 then the contract will expire worthless. In that case I'll get to keep the full option premium as profit. The $1.02 in total credits would be a 2.90% return on the original contract's strike price which is equal to a 38% annualized return. This put option has been with me since all the way back in February, but I just might be able take this one off for a solid win in the next month should GDX cooperate. The original contract was written with a $24.50 strike price and I received a $0.75 credit upon opening the position. I've now rolled the put option out in time twice providing an additional $0.55 in option premium bringing the total credits received to $1.30. The breakeven on the first put option was $23.75; however, with the extra credit from the rolls the breakeven has been reduced to $23.20. That's a 2.3% improvement to my breakeven price. If GDX is above $24.50 at expiration then the contract will be OTM and I'll get to keep the full option premium as profit. The $1.30 in option premium would be a 5.32% return on the $24.50 in capital at stake and would be a 21% annualized return. This next put option has several mistakes on my end. For starters I shouldn't have opened the position when I did. I overlooked the fact that Qualcomm had earnings last week. That's not necessarily a bad thing, but it just wasn't ideal. The second mistake was the fact that I did this roll for a debit, i.e. I paid to roll the contract out in time which I never want to do. I'm okay with paying to roll it since I was able to reduce the strike price by more than the debit paid so net-net my breakeven price was still reduced. This position was opened back at the end of March when I sold a $55.50 strike put option and received a $0.67 credit. Qualcomm's share price has drifted lower since then and I wasn't quite ready to be assigned the shares if I didn't have to be so I decided to roll the position out in time. As I mentioned earlier I paid $0.20 to roll the contract out in time, but I also moved the strike price down by $0.50 to $55. The breakeven price on the original contract was $54.83. After accounting for the net credits received of $0.47 and my new strike price the breakeven is reduced to $54.53. That's just a 0.5% improvement. If Qualcomm is higher than $55 at expiration the contract will expire OTM and I'll get to keep the full option premium as profits. Unfortunately that's just a 0.84% return or 6% annualized if held through expiration. As of now my intention is to take assignment of the shares if that comes to pass. Qualcomm's next ex-div date is May 27 so I'll be able to collect dividend payment and then start selling call options against the position to further reduce my cost basis. Thus far April has been an excellent month for me and had the potential to be my largest month yet in terms of generating option profits. 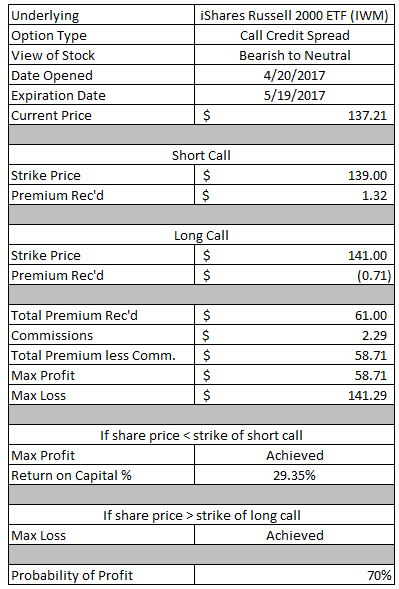 Through the first 3 weeks of April I've generated total profits of $1,524.99 via closed/expired options. Year to date my realized profits are $5,591.74. You are performing some advanced option trading compared to your peers. Any chance of putting up a page detailing some of these strategies with more details and high level analogies? Keep up the great work! I can try and get something together but honestly there's way more content out there already. I'll try and find some links over the weekend, but it might have to wait until next week when I get back to work and can have some free time again. Very well done to you. Not everyone can do it but it seems to be paying off for you. Congrats. So far it's turned out pretty well, but it's been way too short of a time frame to make any concrete conclusions. Definitely not something I've dabbled in, but you appear to be doing quite well. Congrats on being able to successfully manage option trading, here's hoping for your continued success!